A Eurasian species, occasionally well established as an escape from cultivation. Recorded from moist forests and river banks, roadsides, fields and thickets, dump sites and railroads, doubtless established in other sites as well. First collected in 1897 in St. Clair Co. 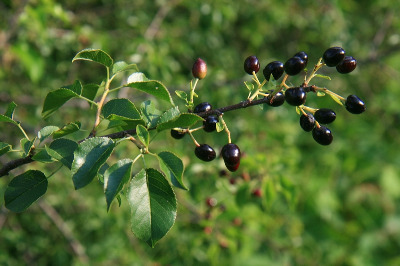 This cherry is grown not for the small inedible fruit but for its fragrant flowers and wood. MICHIGAN FLORA ONLINE. A. A. Reznicek, E. G. Voss, & B. S. Walters. February 2011. University of Michigan. Web. April 19, 2019. https://michiganflora.net/species.aspx?id=2522.